Our congregation is made up of a diverse and caring group of individuals who are united in Christian fellowship with our desire to serve God and our neighbors both near and far. 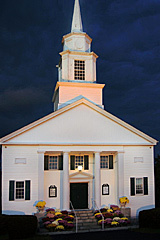 Our church, located in Central Massachusetts has a long history dating back to 1737. We look fondly back at our past as we move forward toward the future and continue our growth as a faith. Our traditional New England Church with it’s tall steeple and war memorial in front, is situated prominently on Main Street. In addition to the Sanctuary, it has two large meeting halls and an addition with ten classrooms. The parsonage, located on nearby Lovell Street, is a four bedroom colonial with a two car garage. “Lighting The Way From Our Past” is the name of our church history book completed for our 250th anniversary in 1992. Starting from 1742 with our first minister, Reverend Elisha Marsh, our church has lived an active life in the community. One of the interesting things that happened in the past was in 1940 the third of our meeting houses burned to the ground. In an effort to raise money, the entire congregation got together and started the first Yankee Street Fair. With help from the town, they closed off surrounding streets and set up booths with foods, crafts, books, entertainment and a baked bean supper. Yankee Street Fair is still running strong today with many fun things for people of all ages. If you have not visited it recently, you should look into our church library, which honors Jane Mason, one of our former members and past librarian. The library has a wide variety of resources for members and friends to use. These include an excellent video series on church hymns with spectacular footage from the British Isles. Another series includes sermons from some of the 20th century’s greatest preachers. Both series are inspiring. There are literally hundreds of books, from classics to children’s books to recently published titles.The library is open any time the church doors are open; it operates completely on the honor system. If you check out some material, please complete a slip of paper with the title of the material and the date checked out. Sign it and leave it inside the little metal catalog box. If you have any questions about the library or the materials available there, please contact Bart Sides, Church Librarian.